We left Dryden a bit later this morning as we had to do a bit of shopping. We hit the road at around 8:25 am with Ignace as our destination 102 km away. As we cycled away from Dryden, we quickly realized that it was pretty warm even at 8:30 in the morning under a cloudless sky. Heat and humidity is not something we experienced much during the past 5 weeks, but it is starting to now affect our daily rides. If it gets any warmer we might have to start much earlier in the morning. 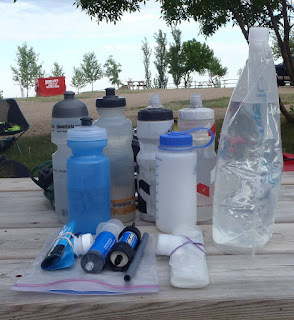 We had read in other blogs that hydration was an issue for many of the cyclists as they were going up Alisson Pass, and some even ran out of water. From the start, we have always carried a lot of water but it is only since we got to Ontario that we arrive at destination with little water left. We each carry 2 x 710 ml water bottle, 1 x 620 ml water bottle and 2 x 2 liter Platypus collapsible water bottles. We stop to drink every 8 km. We also have a water filtration kit just in case. We got cold water from streams in British Columbia but the slow running small rivers just don't seem as inviting to just plunge the water bottle in and fill up. There was not much to see on our ride today. 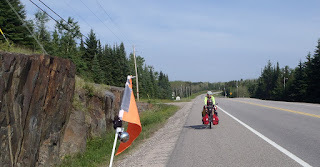 There was sign of human life for the first 20 km or so and again at the 48 km mark when we stopped for fries at "Dan's Darn Good Food" after that nothing till we reached the outskirts of Ignace. Traffic consists mostly of big trucks and sports fishermen pulling their boats. Action shot of Hélène coming up a small rise. She has a big grin (trust me) 'cause she loves them hills! We see the odd pond, but they don't have any of the ducks and other wild life we got accustomed to see and enjoy in the Prairies. Lots of lakes both big and small but after a while they all start to look the same. Over the past five weeks, Hélène took and average of 65 or so pictures a day, today between the two of us, 15 pictures. We want to thank Helen for solving the mystery of why the sign over the doorway of the old Winnipeg Police Station reads 'Toronto Police Station'. This has to do with the fact that a CBC show 'The Murdoch Mysteries' set in Toronto in the 1890s' first filmed in Winnipeg. In regards to the Ukrainian breakfast we had the other morning, the plate was huge, and it included perogies topped with sausage and sour cream, eggs and toast. It fuelled us for the rest of the day. Tomorrow our destination is Upsula, 100 + km away. Can't wait to enjoy that Northern Ontario scenery once again. BTW, Kyle blew by us this morning and we are all at the same campground tonight. Doh! I looked at the Winnipeg door, but didn't notice the name. Glad you mentioned it, Murdoch is one of our favourites. Nice to see a wide shoulder, hope there are many more. We sure enjoy following your wonderful adventure. 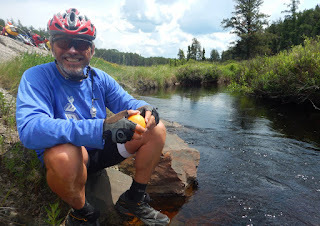 Can't beleive you've done all those km and still enjoying your trip, rain or shine. You're both amazing.